Sometimes there are old toys that end up your favorites and can stand the test of time. They transcend generations, bringing enjoyment to children and grandchildren of the original owners. I have one of those toys which my grandmother originally purchased for one of my uncles, and kept around the house for the grandkids to enjoy. It wasn’t a normal part of our toy retinue, but only came out on special occasions. I’m talking about the View-Master. This View Master was a Model C, manufactured 1946-1955. There are a dozen or so reels with “RC” emblazoned on the envelopes. I would guess that it was probably purchased for him around 1948 or 1949. As a kid growing up in the 1980s, grandma would let me take it out of the bottom drawer in the entranceway dresser and look at some of the beautiful stereoviews from around the country. I could never get enough of those photos. It thought it was so fun to see each picture, taking me to someplace I’d like to visit. I wanted my own to have at home. By the time I got one in the early 1980s, the Bakelite models were a thing of the past and we had a red, plastic Model G. I think ours was made by Fisher-Price. We had a lot of toys from Fisher-Price with several family members working at the Medina plant. The View Master is really a modernization of the old stereoview cards and readers of the 19th century. Probably the best known of these readers was the Holmes reader. It was invented by Oliver Wendell Holmes around 1860. Most people who own a stereoview reader own a Holmes. He never patented it, preferring to give it away for free. His style of stereoscope remained in normal production well into the twentieth century. These are the ones you’ll find in most historical societies and sometimes at estate sales. 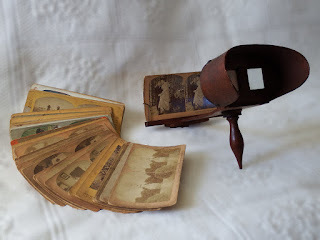 The cool thing about stereoscopes (of which the Viewmaster is one) is that each of your eyes sees the same photo simultaneously, but separately. Your brain renders these as a single, three dimensional image. So, in the century before 3-D televisions, the most basic of technologies was already delivering the goods. 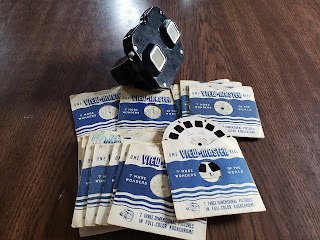 The View Master system was introduced in 1939 in Portland, Oregon when Edwin Mayer, Harold Graves, and William Gruber worked together to find a way to view their stereo images. Mayer had purchased a drug store after serving in World War I, and introduced a photo service in the store. He bought into Sawyer’s Photo Finishing Services, which produced slide projectors and postcards, eventually taking over control of the entire company. Obviously, it would be a boon for their photographic services if they could cater to tourists by giving them a three dimensional view of those postcards and scenic views. The View Master made its debut at the 1939 World’s Fair in Flushing Meadows, New York. Initially they were sold in gift shops at tourist attractions, with the Grand Canyon and Carlsbad Caverns as the first reels sold with the View Master. My collection includes both of these reels. The new invention was extremely popular and by the mid 1940s, they were making over 250,000 viewers a year being sold at over 1,000 outlets. Sales of the View Master reached its peak in the mid-1970s, before gradually declining under the onslaught of computer gaming. In 2000, the View Master production moved from Beaverton, Oregon to Tijuana, Mexico. While they are still made, the popularity is unfortunately waning except for nostalgia. Is there a future for stereoviews in modern society? From Charles Wheatstone’s initial stereoptic invention in 1838, to Jules Duboscq’s 1851 presentation of a stereoviewer to Queen Victoria and Prince Albert, to Oliver Wendell Holmes, and beyond, it has been an extremely popular pastime. The View Master is not done. Mattel and Google joined forces to in 2015 to develop a View Master virtual reality using smartphones. Additionally, in 2019, MGM and Mattel announced that a feature film would be produced based on the classic toy. There still seems to be a bright future for the View Master. In the meantime, I will be checking out some of the old reels that I enjoyed as a kid. Should I follow the adventures of Hopalong Cassidy and Topper, or Sam Sawyer? Or maybe visit Juneau, Alaska; Death Valley, Carlsbad Caverns or the Grand Canyon? I’ve seen them all hundreds of time, but they still seem exciting to the twelve year old Craig. Craig Bacon is going to check out frozen Niagara Falls all while from the comfort of his own home.